Focusing on composition and coloring, Make Manga! is a great next step for pencil artists. While sketching is almost a sixth of the book, it seems too brief for most beginning manga artists. The inking and especially coloring sections are extremely well done. Most pages explain both what to do and why. Note that the author uses exclusively watercolor for backgrounds and large areas of characters. It may not be a good fit for those who dislike that type of media. The chapters on composition and creativity are particularly useful for self-taught artists. There are also step-by-step guides in the back to create a day and a night composition for those needing more assistance. 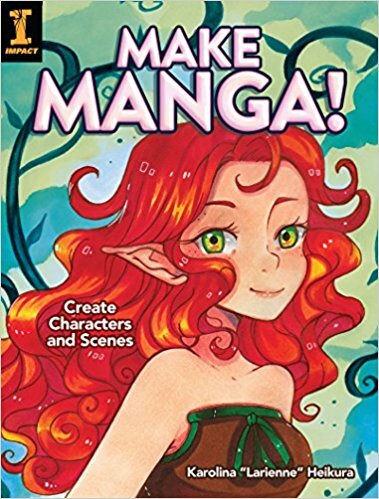 Make Manga! would make a great gift (along with some art supplies) for the budding artist in your life. 3 stars! Thanks to the publisher, Impact Books, and NetGalley for an advanced copy. This book will be published on 4/17/2018.